India, US agree on pharma regulation Nations to conduct joint inspections of pharma facilities in India as govt expresses concern over FDA action on firms Reviewed by PHARMALEADERS on February 14, 2014 . New Delhi: US and Indian drug regulators agreed on Monday to conduct joint audits and inspections of pharmaceutical manufacturing facilities in India. The agreement came after a “free and frank” exchange of views thatMargaret Hamburg, the commissioner of the US Food and Drug Administration (FDA), had with officials of the Central Drug Standard Control Organization (CDSCO) in New Delhi. 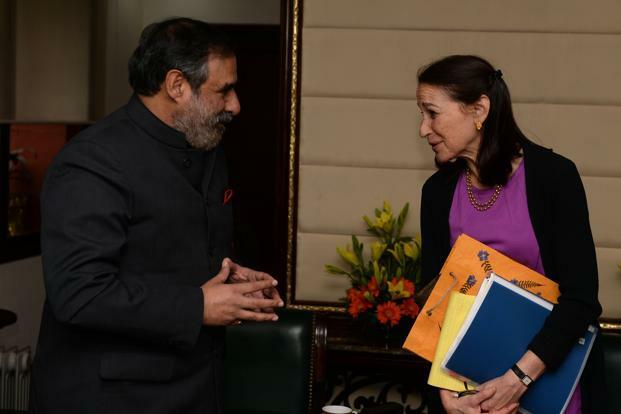 Commerce and industry minister Anand Sharma (left) meets USFDA commissioner Margaret Hamburg in New Delhi on Monday. “This is a step (for the Indian regulator) to understand global benchmarks and help Indian drug regulators meet international standards,” G.N. Singh, the drug controller general of India (DCGI), said after the meeting. Hamburg’s visit comes after the FDA on 23 January banned a Ranbaxy Laboratories Ltd facility in Toansa, Punjab, from exporting drugs to the US. It was the fourth Ranbaxy plant to face regulatory action by the FDA. In 2013, Ranbaxy agreed to pay a fine of $500 million to US authorities after pleading guilty to felony charges relating to the manufacturing and distribution of some adulterated drugs made at its Paonta Sahib (Himachal Pradesh) and Dewas (Madhya Pradesh) units. Other Indian drug makers have also faced penal action by FDA for not complying with prescribed standards. Indian authorities expressed their concern over the FDA’s audit inspections of Indian pharmaceutical companies and the “disproportionate penalties” imposed in some instances, said an official close to the development. India plans to submit a paper to the US outlining concerns over the duration of the registration process for drugs, said trade minister Anand Sharma, who met Hamburg. “We have agreed to create an institutional framework to sensitize and educate the domestic pharmaceutical industry with regards to the certification, registration, the processes which the Indian pharmaceutical industry as a whole needs to get involved in,” Sharma told reporters. Hamburg described the meeting as “excellent” and didn’t offer further comment. An official said India drew the FDA commissioner’s attention to the fact that most audit inspections were not followed by discussions with firms. In some cases, clarifications were sought but even before a response, harsh decisions had been handed down. The US is the largest market for Indian pharmaceutical firms. In the last fiscal year, India’s pharma exports increased 10% to $14.6 billion, with shipments to the US accounting for about 26%. India is the largest exporter of generic drugs to the US by volume. It has around 320 FDA-approved pharma facilities, the largest number outside the US. India also raised the issue of the high fees for certain services rendered by the FDA and delays caused in several approval processes. Indian Pharma Stocks on High!